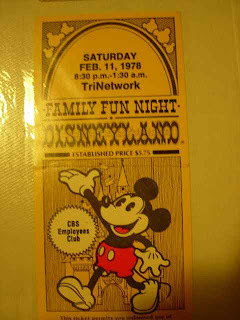 This is a ticket to "Family Fun Night" at Disneyland. This ticket was for CBS employees. Notice that this event was held on February 11, 1978, and that it lasted from 8:30PM til 1:30AM. This ticket was from the era when Disneyland had ticket books. However, when Disneyland closed down for special "Family Fun Nights", you only needed one of these event tickets to ride all the attractions. Notice that the price on this ticket is $5.75- really cheap by today's standards.